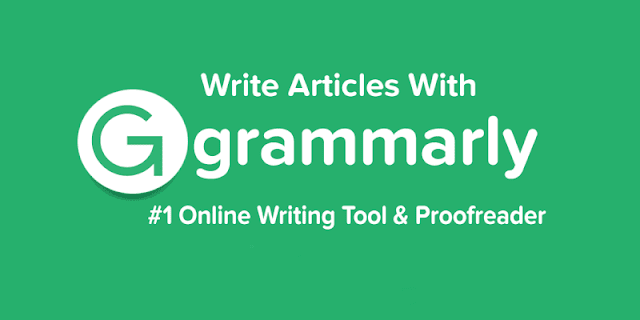 Using Grammarly is one of the simplest things due to its user-friendly interface. Grammarly is a very interesting spell checker or grammar nazi that can vastly improve your writing. Its best feature, in my opinion, is the browser add-on that gives you correct grammar tips no matter what you're writing (example- Email, Online from, online project, blog etc). While writing this post I am using Grammarly as well. While using Grammarly you have two option FREE and Paid version. While free version has some limitation but enough resources to meet your basic needs. Grammarly is an improved or better form of Microsoft's Grammar and Spell Check. You can either add Grammarly add-on to Chrome or Mozilla or your browser and it will save you from the hassle of incorrect grammar whenever you type online (provided you open the web page via chrome). It also offers synonyms and suggestion with alternative words. It checks for incorrect use of tenses and grammar and other (difficult) grammar thingies. Grammarly also provides other products like Plagiarism Checker (I used for this post), Spell Checker(Best one) and an MS Office Add-in. So you can use it online as well as offline with the perfect grammar ever. All in all, Grammarly rocks! If you are using it for writing an article or blog post then you just have to click on the Grammarly Extension in a top right corner of your browser. And scroll down to see New Document. After you click on it you will be redirected to Grammarly Documents. Then there will be three options New, Ctrl +V ("Paste" as you know) and Upload. If you want to write the whole article then simply click on NEW. Paste your article or document title and your full article and look for your grammatical mistakes. If you have written your article in a text file then you upload the .txt File or your document to check grammar using Grammarly. Excellent online grammar checker. Grammarly is a useful, easy to use, user-friendly and affordable writing tool that belongs in your toolbox. It will help you search and fix issues in your writing easily and help you to correct those. Is Grammarly safe to use? I’ve used Grammarly for over last one year, and I’ve never had any issues with my writing, rather I have a good experience using Grammarly. Can Grammarly be used in Google Docs, Word, blogger etc.? In fact, I am using Grammarly while writing this article. You can use Grammarly in many common writing platforms directly like email, blogger, Google docs etc without any issues. Yes, Grammarly (Need to upgrade to Premium to use this feature)can identify issues in your work or blog writing and also inform you if your writing was plagiarised elsewhere. Will Grammarly work on Mac devices? Yes, You can use Grammarly on your Mac devices without any issues. How does Grammarly Premium work? Grammarly Premium works by pointing additional grammar issues in your writing to an advanced level and showing options to correct your mistake. If you’re unsure or want have a try before going for the premium one, try the free version of Grammarly. What is the Grammarly subscription refund policy? If you are using Grammarly Premium and do not like it, you can contact Grammarly support through their website and get your money back without issue, within a certain period. How can I get Grammarly Premium for free? You can’t! However, get the free version from their website without any hassle and add the add-on to your browser to start using. When you are ready and want to have more features you can upgrade your plan from their website. Grammarly helps me to find and fix issues in my writing that word missed. Yes, Grammarly offers an application for iPhone and Android both.